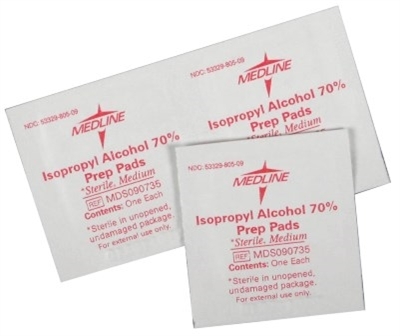 Medline Alcohol Prep, Medium. Soft, absorbent, non-woven pads are saturated with 70% isopropyl alcohol. Helps prepare site for injection or incision. Sealed in airtight, poly-lined foil pouches minimizes dry pads. Sterile. This case has 3,000 individual separated pads bulk in one box.